Holstein's first theatre, The Scenic, built in 1914 by Claus Lorenzen, flourished until the advent of sound movies in the late 1920s. In 1927 Claus Paulsen opened a new, dome-shaped theatre, equipped for sound. When the Seff Brothers rented the building in 1929 the name was changed to the State. The theatre was rebuilt in a Quonset Hut style in 1948. The architects were Peacock and Belongia of Milwaukee, WI. ​The theatre continued to change ownership, passing from Carr and Holmes to Mr. Eberhardt, Fred Levi and then Mr. and Mrs. Eddie Kugel in 1936. Greg and Gary Johnson became owners in 1974: in 1975 Greg became sole owner. 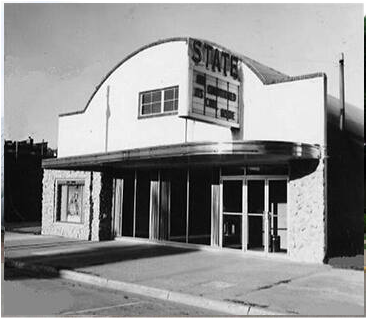 Corrine and Tom Yates bought the State Theatre in May 1979. It is one of only 10 surviving theaters of its style in the country. The State has been lovingly renovated and converted to a digital cinema, now run by volunteers, showing second run films and classics.